Don't you just love Mondays! No? Hmmm... well, now you have a reason to. Colie hosted her weekly Sunday Brunch Crunch chat at Gotta Pixel yesterday and even if you missed it, you can still enjoy her gift and challenge. Colie wants you to scrap! So she is giving away another of her incredible templates to jumpstart your inspiration. Your challenge this week is easy peasy again. You get to pick the theme! Just grab this super fun template and scrap a page with it. Don't have any ideas? How about the weather! It's starting to change for most of us and can sometimes be a little crazy. Check out this awesome kit Colie has in her stores to celebrate it. You don't have to use this kit, of course, but grab something in the store or in your stash and get to scrapping! And don't forget, you can chat with Colie every Sunday morning at 10am EST in the Gotta Pixel Chat room! Another FREE Template for Another Challenge! Now Playing! And a freebie. Sunday Brunch Chat NOW! WOOT! 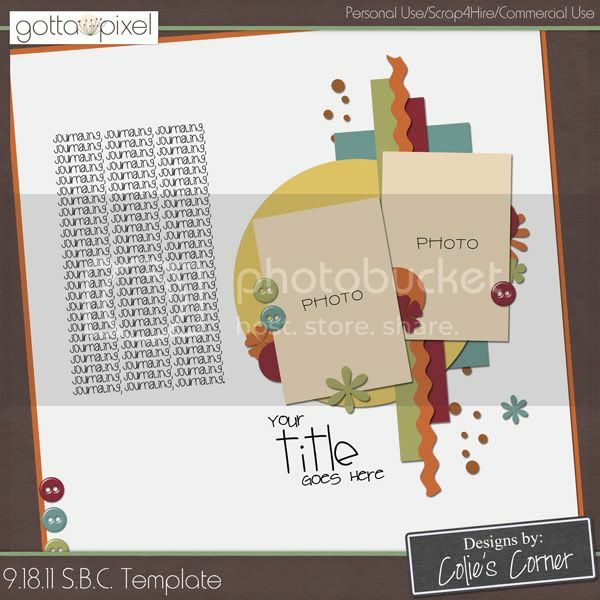 New Freebie Template and a Challenge from Colie!